Lloyd Codada stood tall at six-foot-three with a towering presence. He made his legend as one of the most storied athletes to ever play for West Orange High School. 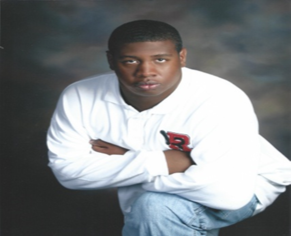 In addition to receiving a division-one scholarship to play football at Temple University, Lloyd also excelled in track and field, where to this day, he holds the shot put relay record for West Orange High School. As an offensive lineman, it was Lloyd's job to protect his teammates and create a path to success. Lloyd carried the values he learned from the game of football to his personal life; always making his friends feel safe and providing them with love, positivity, and optimal advice. Unfortunately for Lloyd's opponents, they never got to know the "Gentle Giant". There's nothing gentle about getting "pancaked" (a block that leaves a defensive player flat on his back) One may wonder, how could such a dominating athlete with a ferocious mean streak be considered a gentle giant? Our answer is found on Mothers Day, May 10th, 1989 at Beth Israel Hospital in Newark, NJ, where Lloyd Codada was born premature at three pounds and ten ounces. Yes, Big Lloyd was once three pounds! Humble beginnings for a soul who simply could not wait to meet the world. Lloyd was an only child to his devoted parents, Lucky and Bernadette. Lloyd knew that his parents supported him with all their heart; therefore making his parents proud would become his life goal. It was from this nurturing environment, that the legend of the Gentle Giant was born. Lloyd used to say, "I don't want people to think I'm just this big guy..." Lloyd always had an expressive spirit. As a child, Lloyd made home videos, usually before big celebrations such as his communion, birthdays and of course Mother's day. With his father Luckey filming, Lloyd could be seen jumping around, singing, laughing, and smiling, introducing the world to what we now know as the "Dada Effect." physical stature quickly caught the eye of his eventual high school football coach, John Jacob. Coach Jacob became the head football coach at West Orange almost simultaneously as Lloyd entered 9th grade. Lloyd served as one of the first success stories of the culture Coach Jacob and his staff would preach to their student athletes. Football wasn't a game they played, but rather a life that they lived. The West Orange Mountaineers morphed into WEST FOOTBALL, a loyal brotherhood that encouraged young men to reach their highest potential, on and off the field. The motto of WEST FOOTBALL was built on two words, STRENGTH and HONOR. What better way to describe our brother Lloyd than being a strong and honorable man? Lloyd's success did not come easy. He rarely saw the field his sophomore year and battled injuries during his junior year. However, Lloyd remained positive and did everything his coaches asked of him. No matter how difficult the program got, Lloyd stuck with it. He never quit. Through hard work and determination, Lloyd broke out in his senior year. Lloyd helped lead West Orange to 8 wins, which included a home playoff victory, setting the school record for most wins in a season. Lloyd earned all conference and all state honors as an offensive lineman, accompanied by recruiting letters from division-one universities to play football. In 2007, Lloyd graduated from West Orange High School and accepted a scholarship to play football at Temple University in Philadelphia. First year head coach, Al Golden, who also was trying to build a new culture at Temple University, recruited Lloyd. It says a lot about Lloyd's character, that both of his football coaches identified him as someone they could trust to properly represent the initiatives of their respective football programs. Lloyd started the first 6 games at Temple during his freshman year. Lloyd's teammates were impressed by his maturity and remember him mostly for being a quick learner, and they could always count on him for a good laugh. Due to injuries, Lloyd's dream of playing football was cut short. However, Lloyd did not stop pursuing his education. He continued schooling at Essex county community college and in 2012, he graduated from Rutgers Newark with a degree in sports management. Although his football days were behind him, Lloyd still possessed a burning desire to be successful and make his parents proud. Lloyd worked many jobs in different fields. Whether it was security, food, retail, or sales, Lloyd always showed up to work with a positive attitude and a larger goal in mind. That goal was to invest in his new Plan A, music. Lloyd performed Hip Hop music under the name, "L Dada". His deep voice, relatability, meaningful lyrics and strong stage presence made him a crowd favorite at music showcases. As he honed his skills with his longtime brotherhood and Music Group FUI (Financially United Individuals), Lloyd branched off and recorded dozens of records with a collective entitled PNE (Pockets Never Empty). Some of the themes in Lloyd's music include, Black Empowerment,Financial Literacy, Perseverance, Chasing Dreams, Spirituality, Family, and Love. School, Football, Work, and Music aside, Lloyd knew how to throw a party. With the help of Momma B's cooking and remarkable hospitality, Lloyd hosted the most nostalgic house parties his friends have ever been to. Lloyd brought the spirit of his house parties to the nonprofit and entrepreneurial worlds by organizing toy drive events and networking mixers for aspiring artists. In his recreational time, Lloyd enjoyed fitness, playing basketball, eating a good meal, walking, admiring nature and rooting for his favorite professional sports teams, the Miami Dolphins and the Miami Heat. Lloyd was a humble intellectual. He wasn't short on opinions, but he respected everyone's right to express themselves freely. Above all, Lloyd wanted the world to be more positive, practice Love, and never give up on their dreams. His Facebook bio reads, "Die for your dreams because life isn't Promised but Death is."